Fashions from the late 1800s to 1960s are represented in the most current exhibit at the Museum of Lifestyle & Fashion History. 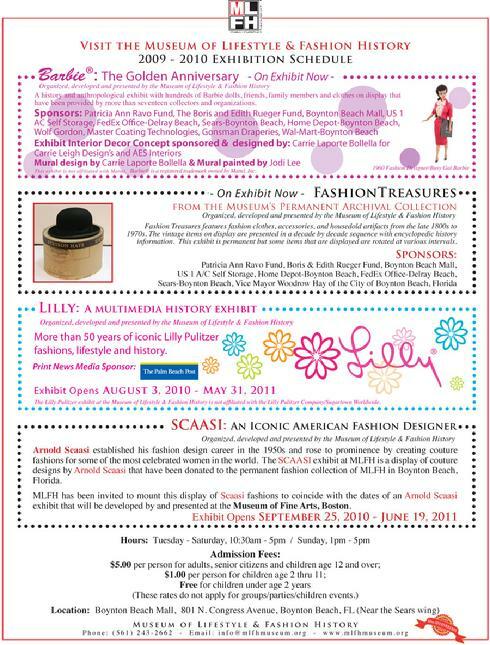 The exhibit is entitled: Fashion Treasures from the Museum�s Permanent Artifact & Fashion Collection. This fashion exhibit first premiered in year 2005 at the Museum of Lifestyle & Fashion History�s former location in the Pineapple Grove Arts District located in Downtown Delray Beach, Florida. The 2010 Fashion Treasures exhibit has been modified and enhanced. The exhibit was developed based on items from the Museum�s permanent artifact, archival and fashion collections. Fashion Treasures was curated by Lori J. Durante who serves at the Executive Director/Chief Curator of the Museum of Lifestyle & Fashion History. Fashion Treasures is a chronological exhibit displayed in a decade by decade sequence from the late 1800s to 1960s. Through this exhibit, visitors will have an opportunity to learn how lifestyles, status or wealth, the economy and war influenced extreme changes in clothes design from one decade to the next. The exhibit is also recommended for students who are doing research for school projects about history, social studies, anthropology, fashion and/or textiles. Although Fashion Treasures is a permanent and on-going exhibition, the items, clothes, accessories and artifacts are presented in the exhibit on a rotating schedule and will be changed or modified seasonally. Presently, over 40 items selected from the museum�s permanent archival, artifact and fashion collection are featured in the exhibit, such as a black 1890 silk bustle skirt and black whale-boned bodice (top) which are both fine examples of the S-bend silhouette that was popular during this period. These items were donated to the Museum by Marion Cone of Lake Worth, Florida. Another item on display is a circa 1920s men�s Stetson hat that was donated to the Museum from Chris Fraser of Delray Beach, Florida. The Stetson hat once belonged to her late grandfather August Henning Youngren who was born in 1869 and was from Galesburg, Illinois. Other fashions showcased represent the 1920s, 1930s, 1940s, 1950s and 1960s. The fashions of the 1920s represent women�s styles that were free of the corsets and bustles and offered straight, knee length silhouettes with frilly designs. The 1930s clothes had the bland simplicity that was influenced by the great financial depression of that decade. A 1938 fancy dress worn, by Kathleen Van Hoose Snow of Shreveport, Louisiana, to a wedding is among the rare and more stylish dresses from the Great Depression period that is displayed. The 1940s fashions reveal shorter hemlines and fewer decorations due to the government imposed fabric rationing because of World War II. The 1950s introduced a return to high-glamour � a celebratory period because the war had ended. Nancy Fisher Alley of Boca Raton, Florida donated to the Museum her mother�s 1949 Maytag Dutch Gas Stove which is displayed in this exhibit. There is also a black Chanel handbag from Geraldine Roberts-Lebowitz of Boca Raton featured in the exhibit component about Chanel�s famous 2.55 (February 1955) bag that was inspired by military bags used by soldiers during during WWII. The exhibit also includes a display of hats representing various cultures and religions from Tibet to Catholicism that were donated to the Museum by Gene Hacker of Delray Beach, Florida. Countess de Hoernle of Boca Raton, Florida donated a number of fashion accessories to the Museum in 2002 and her 1950s green silk Chinese purse is displayed in the exhibit also. And, Military and ROTC hats of Dave Randolph, former Vice Mayor of Delray Beach, are shown. As well as on loan from his wife, Mary Randolph, is her 1960s Nurse�s Cap from the School of Nursing at FAMU. 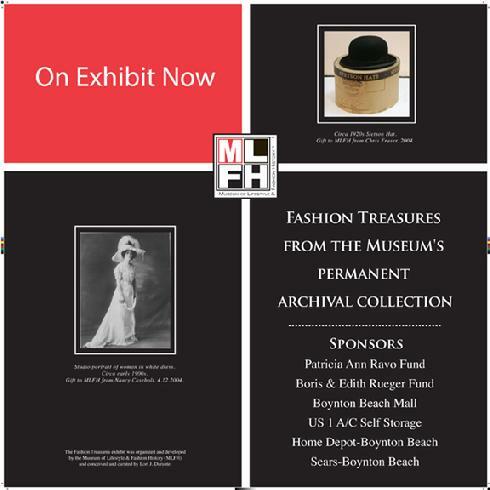 To date, the Fashion Treasures exhibit is sponsored by the Patricia Ann Ravo Fund, the Boris & Edith Rueger Fund, Boynton Beach Mall-Simon Malls, US 1 A/C Self Storage of Boynton Beach. The Mannequins were donated by Saks Fifth Avenue of Palm Beach, Florida. Group tours and curriculum-based school field trips are available.